Warcraft II Part #32 - Who's winning this damn war? Part 32: Who's winning this damn war? Who's winning the damn war? Alright, so you may be asking yourself: "Azzur, with all this back and forth action, what's actually going on in this war?" Well, wonder no more! I am here to cure your ailing minds. Let's take a look at this instructional map. As you can see, both human and orc start the first mission by building the respective bases that the other must destroy. However, you must remember that the Alliance is fighting a defensive battle. While they are bolstering the defenses of Hillsbrad, the Horde is merely setting a staging ground for the Northlands. That said, I'll narrate this quickly from both sides. Zul'Dare is established to assault the human territories to the north. A preliminary scouting trek into Hillsbrad shows that Zul'Jin and his soldiers have been captured by the Alliance. The orcs free them and the trolls join the Horde. Meanwhile, they have moved to Southshore where they have a bitter dispute over oil rights, with open combat truly beginning. The Horde prevails over the human forces here and take Southshore, providing them with a solid foothold against Hillsbrad. They press the advantage and destroy the town. (There may be some confusion regarding where Hillsbrad once stood. The town occupied the stretch of coast west of Southshore with a secret prison "hidden" in a forest to the north. This is not to be confused with the town of Hillsbrad the exists in WoW.) The town was completely razed to the ground with not a person left alive. The humans begin working to establish Hillsbrad when they received word that a number of elves had been taken from Tarren Mill. The Alliance sent forth troops to free the elves and support the town which was preparing itself for an orcish assault that would never truly come. (Here things are rather confusing geographically. 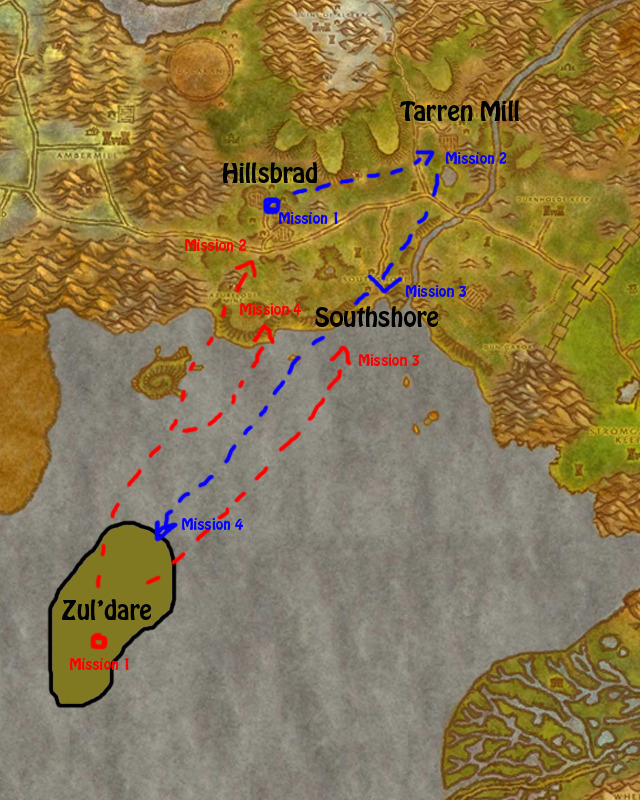 In Warcraft II and the accompanying map, Tarren Mill is a coastal town in generally the same area as it is in World of Warcraft. However, it is now settled next to a river with no access to the sea. My speculation has something to do with the global warming of Azeroth since the region is no longer a frozen tundra. I blame the elves for the global warming.) The Alliance then moved to reinforce the seaport of Southshore, but they were too late. The most that they could do was evacuate any remaining survivors to Hillsbrad. Thinking that the offense is the best defense, Admiral Daelin Proudmoore ordered for the soldiers to counterattack and lay siege to the orcish base of Zul'Dare. They succeed in driving the orcs out, but at the cost of Hillsbrad. So can we truly call victory for either side after the first skirmishes? I like to think that the orcs have won the first round. Hillsbrad is destroyed, and they have amassed a large amount of oil from Southshore (although it is implied that they are forced to abandon the town after Zul'Dare falls), and they have gained an alliance with the trolls. However, the humans have somewhat successfully defended the Northlands. The orcs cannot gain any more ground in the area, and they are forced to retreat. My thoughts? A victory for the humans psychologically ("We fought off what slaughtered Azeroth six years ago, so we can do this! "), but an economic and diplomatic victory for the orcs. Sure, the humans truly gained the elves' allegiance, but it was only a matter of time for that to happen anyway. This means that it's time for Act II: A Trip To Dwarven Lands (It Menaces With Spikes Of Arcanite). It also means that we are treated to some short cinematics!